Gulf War exposures may have added health risks to active duty military during Operations Desert Shield, Desert Storm (beginning August 2, 1990) up to operations in that region post-9/11. These include a variety of environmental and chemical hazards, which are described below. A series of vaccinations, including vaccinations for yellow fever, typhoid, cholera, hepatitis B, meningitis, whooping cough, polio, tetanus. Approximately 150,000 troops received anthrax vaccinations, and approximately 8,000 troops received vaccinations for botulinum toxoid. 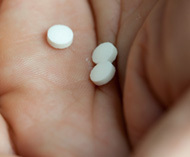 One of the main areas of interest is the anti-nerve agent pill, pyridostigmine bromide (above), which was given to troops as a preventive measure against death in an attack by enemy troops using soman, a nerve agent. Pyridostigmine bromide was supplied in a 21-tablet pack, and prescribed dosage was one tablet every eight hours. The use of the OP pesticides and DEET has been credited with keeping rates of pest-borne diseases low. Studies have casually associated pesticide use with Gulf War Syndrome. 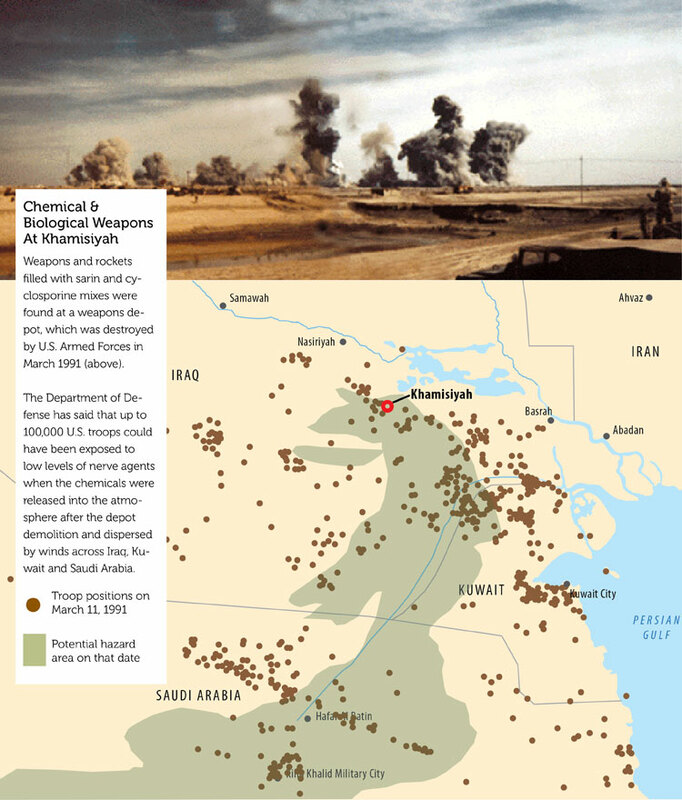 More than 600 oil wells were set ablaze by Iraqi armed forces in January and February 1991 as they retreated from Kuwait. These fires produced thick clouds of soot, liquid, aerosols and gases that remained low to the ground in areas of Iraq, Kuwait and Saudi Arabia where U.S. troops were located. Soldiers experienced skin irritation, runny nose, coughs, shortness of breath, eye, nose and throat irritations, and aggravated sinus and asthma conditions. Veterans who were deployed to the Persian Gulf region experienced a sandy, dusty landscape where the winds exposed them to sandstorms, pollution and airborne particulates — which can cause serious health problems because they’re inhaled deep into the lungs and air passages. The particulates can also include liquid droplets with acids, chemicals, and metals. A study released June 2 at the Symposium on Lung Health After Deployment to Iraq and Afghanistan linked titanium and other metals in Iraq dust with dust present in the lungs of six soldiers. You can read what the VA says about particulate matter here. Depleted Uranium is what remains from the manufacturing process of enriched uranium used in nuclear reactors or weapons. It has the same chemical toxicity as natural uranium, retains radioactivity, and a half-life of 4.5 billion years. 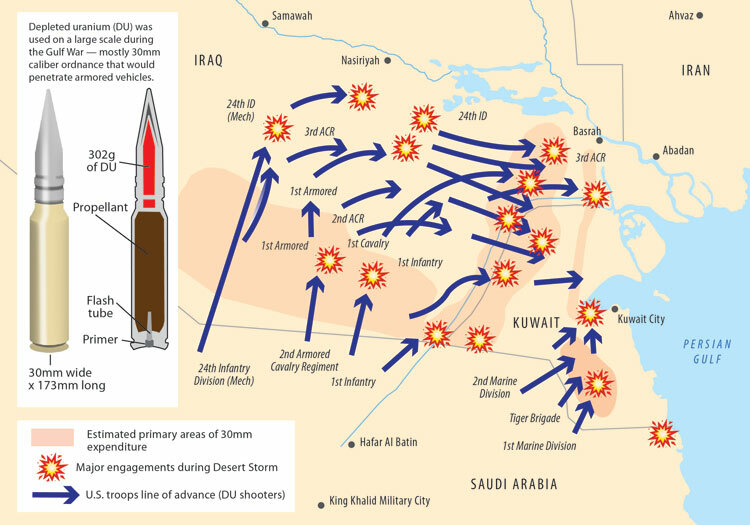 DU was used on a large scale during the Gulf War in tank armor and some bullets or rounds — mostly 30mm caliber ordnance — to penetrate enemy armored vehicles. Riding in a vehicle with DU weapons or shielding is not linked to exposure of significant amounts of DU or external radiation. However, DU can be a health hazard if it enters the human body. In a struck vehicle, soldiers could have been exposed through wounds if fragments of DU scatter and become embedded in muscle and soft tissue. Soldiers could also be exposed to DU by inhaling or swallowing small airborne DU particles in a struck vehicle or in close proximity to burning vehicles or fires with DU munitions. Chemicals from the fragment that enter the bloodstream, affect the body. Chemical Agent Resistant Coating is a paint used on U.S. combat vehicles that make them resistant to corrosion and the penetration of chemical agents. What is harmful to soldiers is the inhalation of CARC during the painting and drying process. The noise from gunfire, explosives, rockets, heavy weapons, jets and other aircraft, and machinery can contribute to hearing loss and tinnitus (ringing in the ears). In fact, tinnitus is the most service-connected disability compensated by the VA for all veterans, with more than 1.1 million cases. Not surprising that heat stroke, heat exhaustion ans sunburn show up as exposure issues for servicemembers serving in the hot, desert climates of the Persian Gulf region. Veterans who suffered from heat injuries in service are more susceptible to heat and more serious heat injuries in the future.